This should be done in a double boiler, but if you don't have one (I don't) you can use a 2 cup size glass measuring cup and place it in a small pan of water on your stove. With the stove on a medium heat, melt beeswax, then add shea butter and coconut oil, till melted in glass cup. It will be a clear liquid. Add chocolate chips till melted. Then take off heat and add essential oil. Pour into small containers and let sit till cool. That's it. Easy. Each year my kids like to make gifts for their friends at Christmas time. We made our candy trains as we always do, but my daughters are getting older and wanted something more for their friends. We searched through lots of lip balm, lip gloss recipes online and decided to make our own version based on some of the others. The recipe calls for 1 TBSP beeswax, but our local health food stores didn't carry the beeswax pellets. Instead we bought the bars of beeswax ($1 each) and 1/2 of one = 1 TBSP. You could make several variations on this recipe. 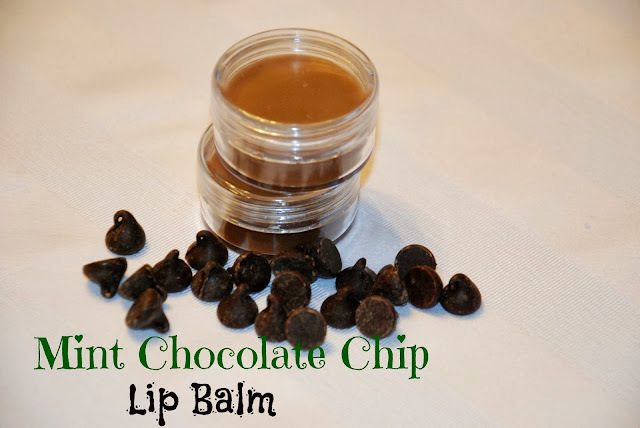 You could use any essential oil that you like in place of the peppermint, and the chocolate chips are optional. I read on some of the other recipes that they bought a little container of blush, or any powdered makeup and used a tiny bit to add color to the lip balm. I wouldn't recommend using food coloring. We found all of the items necessary at our local health food store. Also the containers we used are bead holders that we found in the sewing section at Walmart.